As usual - this review originally appeared on the Surfbits review cast here. You can also hear my dulcet tones on the Reviewcast Podcast #106. While I pride myself on being organized, I've never really been much for the latest organizational fads. Go into any bookstore and you will be tripping over books about how to be more productive. So it was with this mindset that I began reading about David Allen's "Getting Things Done." It seems to be a bit of a Mac phenomenon with many Mac users and bloggers extolling the virtues of this system. I wasn't so sure about GTD but I knew I needed a better way of tracking my to-do list items than what I was getting out of iCal so I began playing with some of the software. I first tried the Kinkless Scripts for OmniOutliner Pro. http://kinkless.com/. While this is an impressive bit of work, it didn't really grab me and I wasn't all that excited about running my task lists through OmniOutliner. I decided to fire up version tracker and stumbled into iGTD. http://bargiel.home.pl/iGTD/ This application hooked me as soon as I started it up. iGTD is a task manager on steroids developed as "Donationware" by Bartek Bargiel, a 26 year old programmer in Poland who's name I probably just butchered. What Bartek has done here is one of the reasons I love my Mac. It doesn't require a multimillion-dollar budget or a hip marketing campaign to make great software on the Mac. With OS X, a guy on the other side of the planet working out of his apartment can make an outstanding application that makes my life easier. I've spent many years trying to get organized on the PC and programs like iGTD simply don't happen there. Anyway, on its most basic level iGTD allows you to attach a project to each task such as finances, classes, work projects, or even "obtain world peace." This is all fine and dandy but not particularly new. 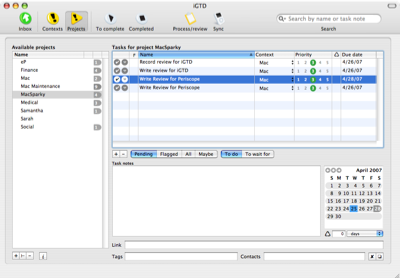 However, iGTD also allows you to categorize each task by context. For instance I have contexts for email, telephone, sitting at my Mac, shopping, and a variety of other places. Now having placed my task lists into iGTD with these two criteria I can easily sort and conquer. For instance, I'm at the phone talking to an insurance agent to handle a financial task but I have a few more minutes. I can click iGTD to give me a list of all phone tasks. Hey look at that! I'm supposed to make an appointment with the Dalai Lama to figure out that world peace thing. I'll call him right now. I don't profess to be a GTD guru, but sorting your tasks by project and context can really help. 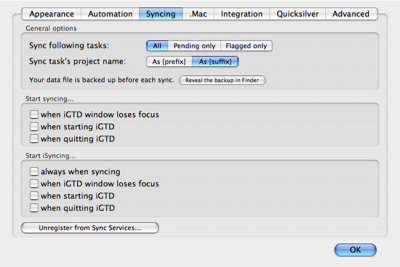 What really makes iGTD stand above the other Mac GTD applications is Bartek's commitment to it. It seems like the program updates every few days. I'm wondering if this guy is getting any sleep. He has built in tags, address book links, .Mac synchronization (in beta), iCal synchronization and my two personal favorites, Quicksilver and MailTags 2.0 support. The Quicksilver support is fantastic allowing you to encode the entry along with project, context, priority, due date, and even a note. This allows me to drive a task into iGTD as fast as I can think of it. Enough to make my geeky head explode. If Quicksilver is not your thing, he has also programmed a menubar icon that allows you to drop a task in lickity split. The amazing thing is the feature set seems to grow on a daily basis. iGTD is donationware. If you get hooked on this program, I strongly you send a few dollars Bartek's way. I really want this guy to keep developing for the Mac. Another developer that I really like is The Omni Group. I've heard they are also working on a GTD application for the Mac and I will be interested to see that. However, iGTD sets the bar high, and its free. If your are even just curious about GTD or want to get your task list better organized I can confidently recommend iGTD.